Barbados is a parliamentary democracy within the Commonwealth, in which the British monarchy (represented by the Governor General) is the head of state and the Prime Minister is the head of government. Parliament is based on the Westminster model (the model of parliament of Canada and the UK) and consists of Her Majesty (represented by the Governor General), the Senate (the Upper House), and the House of Assembly (the Lower House). The approval of the Senate and House of Assembly is required for legislation to pass; however the Government is responsible solely to 'the people' through the House of Assembly. Under the Constitution the Senate consists of 21 persons appointed by the Governor General. Twelve are Government senators appointed on the Prime Minister's advice and two on the advice of the Leader of the Opposition. The remaining seven appointments represent various interest groups. The House of Assembly consists of 30 members elected by majority vote in each parliamentary constituency. Members of Parliament serve for a maximum of five years. Major political parties are Barbados Labour Party (BLP), Democratic Labour Party (DLP), and People's Empowerment Party (PEP). For more information visit "Access Barbados". Dame Sandra Prunella Mason, GCMG, D.A., Q.C. was born on the 17th day of January, 1949 in East Point, St. Philip, Barbados. On leaving St. Catherine’s Primary School at age nine, she attended Queen’s College, where she successfully obtained seven GCE O Level qualifications and A Level qualifications in French and English. Her tertiary level education at the University of the West Indies (UWI), Cave Hill Campus, Barbados and the Hugh Wooding Law School, Trinidad, saw her obtain a Bachelor of Laws (LL.B) degree in 1973 and a Certificate of Legal Education in 1975, respectively. In doing so, she became the first Barbadian female Attorney-at-Law to have graduated from the Hugh Wooding Law School. Click here to read the Governor General's full biography. Prime Minister, The Hon. Mia Amor Mottley, Q.C, M.P. The Honourable Mia Amor Mottley, Q.C., M.P., became Barbados' eighth and first female Prime Minister on May 25, 2018. Prior to that, she served as one of two Opposition Senators between 1991 and 1994. One of the youngest persons ever to be assigned a ministerial portfolio, Ms. Mottley was appointed Minister of Education, Youth Affairs and Culture from 1994 to 2001. 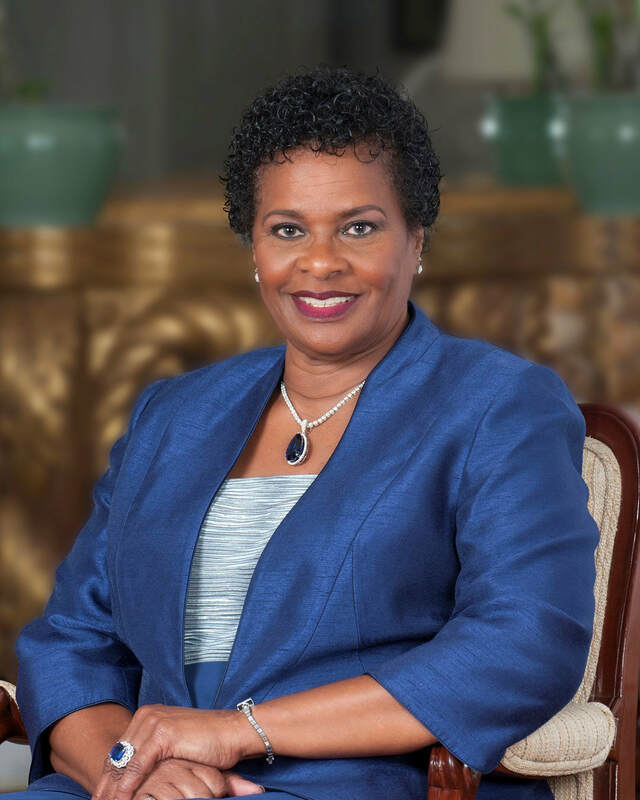 She later served as Attorney General and Deputy Prime Minister of Barbados from 2001 to 2008 and was the first female to hold that position. Ms. Mottley is an Attorney-at-law with a degree from the London School of Economics, specialising in advocacy. She is also a Barrister of the Bar of England and Wales. In 2002, she became a member of the Local Privy Council. She was also admitted to the Inner Bar, becoming the youngest ever Queens Counsel in Barbados.